Soften cream cheese in microwave for approx 1 min on high. Mix well and spoon into graham cracker crust. 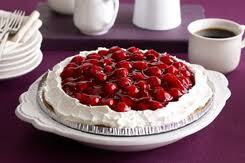 Place in freezer or fridge til pie is set up. Top with cool whip and cherry pie filling. Slice and Serve. Pie can be frozen. I definitely want to try to make this cheesecake, this is my absolute favorite dessert.